I don't know about you, but yellow and green just say Michigan summer to me. Michigan is a very green place in the summer- and we have tons of yellow wildflowers in fields and meadows. Hence, we chose these colors for inspiration for our July photo montage. J. Herbin Hand Blown Glass Dip Pens have a tapered handle with frosted glass and flame design. These pens also come in Amber and Blue. 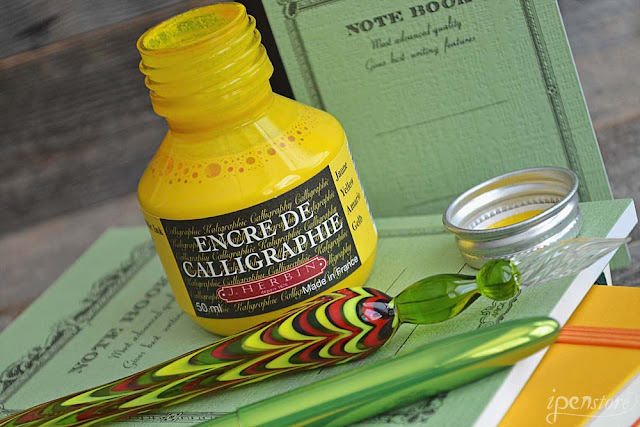 J Herbin's calligraphy inks are richly pigmented to enhance lettering with a visible luster. The inks are suitable for use on either dark or light colored papers. 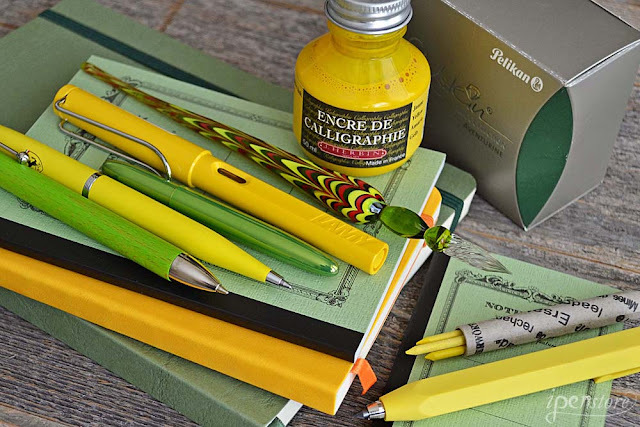 The Caran d'Ache Infinite Series comes in mechanical pencil (884) and ballpoint pen (888). 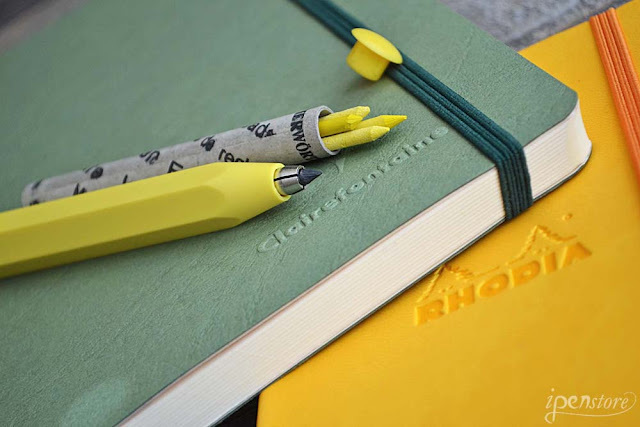 Caran d'Ache is Switzerland's only manufacturer of pencils, and writing instruments. This company has a international repuration for products of exceptional quality and beauty. 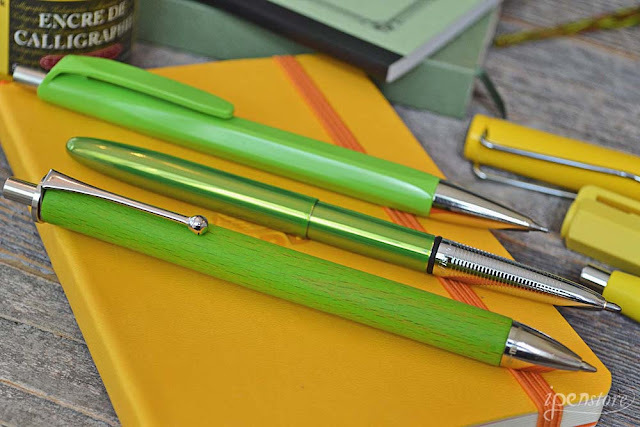 Also pictured: the Fisher Space Pen in Lime Green, and E+M Allwood ballpoint pen. 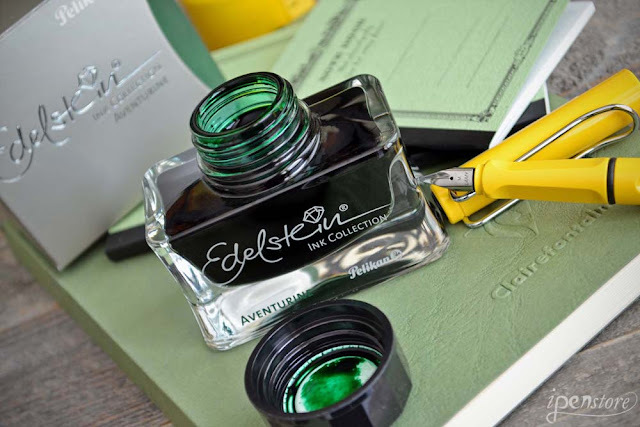 Pelikan Edelstein premium ink collection is comprised of nine brilliant colors with a special ingredient to ensure extra smooth writing and high- performance care for your fountain pen. Worther's Shorty sketch pencil is very highly reviewed and recommended. The lead refills come in 8 vivid colors. The leads are densely pigmented and they are all quite hard. The Shorty sits comfortably in hand and it's refillable and long lasting. No need to sharpen the leads, they self-taper as your write.